Disocactus is a genus of epiphytic cacti in the tribe Hylocereeae found in Central America, the Caribbean and northern South America. It should not be confused with Discocactus, which is a different genus. Species of Disocactus grow in tropical regions either on trees as epiphytes or on rocks as lithophytes. They have two distinct growth habits. Species such as D. phyllanthoides have stems which are round at the base but then become flattened and leaf-like. Other species, such as D. flagelliformis have stems which are round throughout their length. Light: Like all cacti, give them lots of direct sunlight, especially during the summer. Water: During the growing period the plants need frequent watering; from October to March and waterings should be rather abundant, so that the soil becomes completely soaked, but let dry between watering. 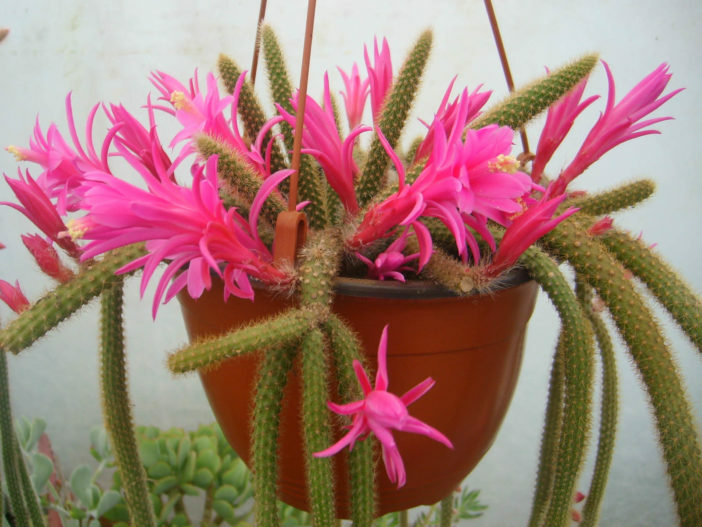 Keep relatively dry in winter or when night temperatures remain below 10° C.
Soil: Well-drained soil is best, and most Disocactus perform well in a soil that contains some organic material. Disocactus can be reproduced both by seeds and cuttings.